B’nai Israel congregation was first organized at the close of the Civil War, as increasing numbes of Jewish merchants and businessmen settled in Little Rock. In the summer of 1866, residents raised money to purchase a Torah scroll and ram’s horn for the upcoming High Holy Day services. Originally called the Little Rock Congregation, the group formally incorporated as B’nai Israel in 1867 and elected Morris Navra as its first president. 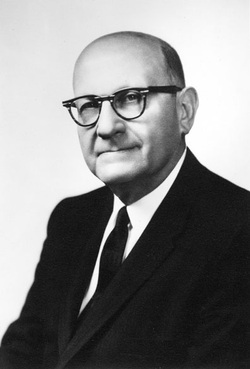 Samuel Peck joined the congregation as a spiritual leader the following year. Many early congregants were adherents to Reform Judaism, and in accordance with the practices of some Reform congregations at the time, they referred to their leader as Reverend Samuel Peck. B’nai Israel was one of the founding members of the Union of American Hebrew Congregations, now the Union for Reform Judaism. The group met in a small room on East Markham Street during its early years. The single room was officially dedicated on July 13, 1867. Soon, the young congregation began to work toward to building a suitable synagogue. In 1869, they purchased land on Center Street. In 1871, they laid the cornerstone for their first building. The congregation hosted a benefit ball to raise funds for a temple at 304 Center Street, which was dedicated in September of 1872. That same year, the congregation acquired land for a cemetery. Congregants also established a Sabbath School called Talmud Yelodim. The school enrolled 69 students in the first six months and began holding confirmation classes the following year. B’nai Israel also offered other communal organizations, including a Temple choir and a Board of Relief established to care for Jewish burials and illnesses. Rabbi Jacob Block served B’nai Israel from 1872 to 1880. Disagreements about religious observances and liturgy led to a rift in the 1870s as the Jewish community of Little Rock began to divine along denominational lines. After disagreements over religious observances and liturgy, a group of more traditional members left to establish a separate Orthodox service. In time, this group evolved into the congregation Agudat Achim. During this same period, B’nai Israel was finding it hard to keep a rabbi in Little Rock. From 1881 to 1891, they had three different rabbis, and went over a year without a full-time rabbi. Rabbi Charles Rubenstein came in 1891, and stayed for six years, playing a leading role in convincing the congregation to build a new home. The increasing arrivals of Jewish newcomers to Little Rock swelled the congregation’s ranks. By the close of the 1800s, B’nai Israel had nearly 200 members and had outgrown the Center Street Temple. In 1897 the congregation erected a large ornate structure on the corners of Broadway and Capitol Streets. The magnificent yellow-bricked edifice bore a Byzantine-inspired dome capping a Romanesque tower as well as tall Gothic windows and spires. The interior, designed to seat up to 700, incorporated elements of Grecian and Roman theater architecture. Rabbi Isaac Mayer Wise, founder of the UAHC, dedicated the new temple on May 9, 1897. Rabbis from Memphis, Camden, Pine Bluff, and Fort Smith were also part of the dedication ceremony. The congregation continued to grow under a series of capable and popular rabbis trained at Hebrew Union College in Cincinnati. 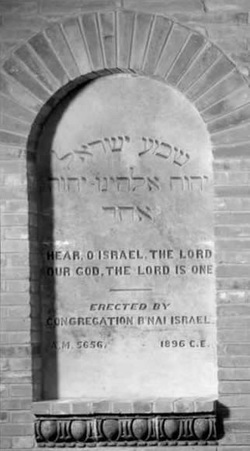 Under the leadership of Rabbi Louis Wolsey, who served from 1899 to 1907, the congregation was so successful that in 1907 the temple was enlarged to accommodate the new members. That same year, B’nai Israel had 220 member families, and an annual income of over $7000. They had 156 students in their weekly religious school. A Ladies Temple Aid Society had been founded in 1903, and boasted 170 members by 1907. B’nai Israel grew over the next decade, and by 1917 it had 300 members. The pulpit at B’nai Israel continued to experience high turnover during the first quarter of the 20th century. Rabbi Louis Witt had the longest tenure, serving from 1907 to 1919. In 1926, Rabbi Ira Sanders assumed the pulpit at B’nai Israel. He had formerly served as associate Rabbi at a large, cosmopolitan synagogue in New York. On Decoration Day of that year (now called Memorial Day), Sanders gave a speech titled: “Why the North and the South Should Meet Together.” Members of the Little Rock community happened to be in the audience, and they were so impressed that they enticed Sanders to accept the rabbinate at B’nai Israel. Sanders agreed and served as the beloved rabbi of B’nai Israel for the next 37 years. The days of the revolving door rabbis were over, another sign in the development of B’nai Israel. During the Civil Rights era, Sanders was an eloquent and vociferous advocate of integration, at a time when many of his congregants avoided the subject for fear of reprisals. The late 1950s saw a spate of synagogue bombings across the south, and in October of 1958 Sanders received a threat that B’nai Israel would be bombed the following Friday eve. Rabbi Groner of Agudat Achim received a similar threat. Sanders decided to proceed with services, and that Shabbat undoubtedly became one of great joy for the Jewish community when the appointed hour passed without incident. The congregation flourished under Sanders inspired leadership. The physical structure continued to expand, adding an education wing in 1949, a memorial library and an art gallery. The Temple was remodeled in 1953 and 1954, and the congregation continued to see strong attendance even as the Jewish population dwindled in smaller Arkansas towns. Rabbi Sanders retired in 1963 and assumed the role of Rabbi Emeritus, a role he served until his passing in 1985. His replacement as the congregation leader, Rabbi Elijah E. Palnick, maintained Sanders legacy of supporting civil rights and facilitating dialogue between Little Rock residents of diverse religious and racial backgrounds. Palnick was followed by Rabbi Eugene Levy, who has led B’nai Israel since 1987. 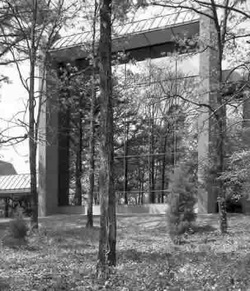 In 1975, congregants made the difficult decision to leave their building and build a new temple in West Little Rock. Many of the furnishings and even edifice stones from the old temple were lovingly preserved. The spacious, modern structure better served the community’s needs, and today the congregation continues to offer a complete range of educational, religious and social programming.